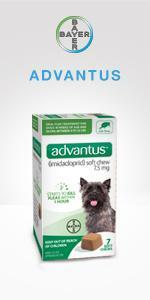 Advantage II helps stop the misery of biting fleas. This odorless, waterproof monthly topical kills fleas through contact, so they do not have to bite your dog to die. Advantage II also kills flea larvae, flea eggs and chewing lice. 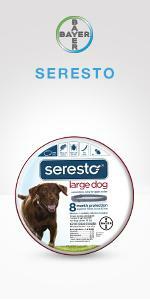 The application is convenient, easy to apply and suitable for use on dogs and puppies 7 weeks of age or older. 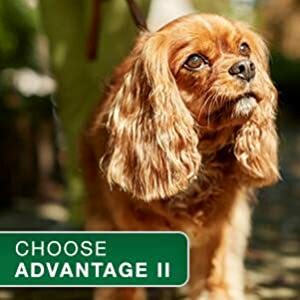 The first active ingredient in Advantage II attacks the flea's nervous system — paralyzing and ultimately killing it. In an existing infestation, you might only be aware of adult fleas, which only represent around 5% of the full infestation and are found on your pet. 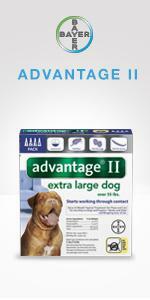 The second active ingredient in Advantage II is an insect growth regulator, killing flea eggs and larvae. Immature flea life stages in a pet’s environment consist of around 95% of an infestation and can be almost invisible to the naked eye. Applied topically, Advantage II kills fleas through contact, so fleas do not have to bite your dog to die. Oral flea medications require fleas to bite your pet and ingest the medication before they are killed. 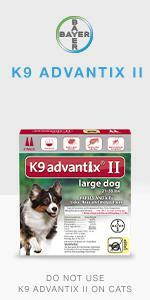 Is Advantage II the right choice for your dog? Whether your dog is a winter snow hound or a summer backyard explorer, an indoor sun seeker or an outdoor enthusiast, choose Advantage II to help keep fleas from interrupting their favorite activities year-round. If you want to return the love of your dog, choose to take care of them with flea prevention that works to break the flea life cycle — killing the fleas you see the ones you don’t — so you can help prevent the misery of biting fleas. Unlike monthly oral products such as NexGard, Bravecto, and Comfortis, Advantage II does not require a prescription and doesn't require a bite from the fleas for the fleas to die. As a convenient, easy to apply monthly topical for use on dogs and puppies 7 weeks of age or older, your dog can enjoy effective protection from the person they can trust.